"When the human mind-emotion-body continuum comes into alignment with life's intrinsic order, there is an avenue for the release of an immensity of power. " Each course usually includes a team of five tutors (including the course director) who are present throughout the training. In addition, "guest tutors" are invited to co-teach a few seminars each. These guest tutors are leading and highly experienced teachers in the craniosacral field. This model provides students with the opportunity to learn from a number of leading teachers, while at the same time benefiting from the continuity of regular tutors. Teaching methods include lectures, the use of visual aids and models, guided practice sessions and supervision from class tutors. 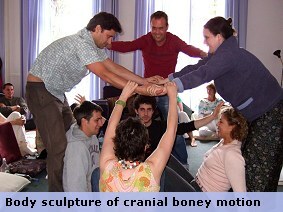 The development of palpation and clinical skills is amply supported by the course tutors. A student to tutor ratio of about 1:4 is maintained throughout the training in order to give comprehensive support and feedback for the learning process. Feedback from class tutors aims to nurture the student's capabilities and personal learning style. Comprehensive course notes are provided to support the learning process. These include diagrams and drawings. Tutorials and small group explorations are included in each seminar. Each student is assigned a tutor who is available for personal feedback and support. Practical applications of the work are emphasized with approximately 60% of course time dedicated to practical session work and supervised feedback. After individual practice sessions, peer group feedback is also shared. Course study continues between training modules. This includes practising skills studied during the seminars, written work, reading and explorations in anatomy. Students are asked to write on a series of topics during the training, the purpose of which is to demonstrate their understanding of the principles and methods presented. As part of each home assignment students are asked to write up at least three practice sessions for review and feedback from group tutors. Students are required to complete home assignments on time. Students are asked to undertake approximately two practice sessions a week outside of class time. These practice sessions may be carried out with fellow members of the student group or with other practice clients. Practice clients are asked to enter into a non-paying, non-professional relationship with the student as the purpose of these sessions is solely to support the learning process. Supervisory feedback on the practice sessions is given during seminar time. Where possible, students are encouraged to form local study groups which meet between seminar times. Students are asked to experience at least ten sessions of Biodynamic Craniosacral Therapy from a qualified practitioner (R.C.S.T.) during the training period to support their own well-being and learning. During the latter stages of the training, students can gain clinical experience under supervision at the Trust's Teaching Clinic in London. The required amount of attendance at the Teaching Clinic varies from four to ten days, according to previous clinical experience.